We are in full “back to school” mode in our house.The craziness has begun! When my kids come home from school, they are usually starving. I love to have quick, easy and healthy snack options for them to eat. 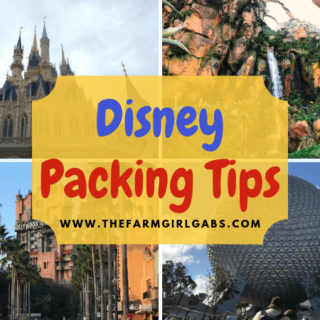 Now that school has started, so too has all the after school practices and activities for my kids. I am always scrambling to find quick but nourishing after school snack foods they can eat on the fly. Having snacks prepared in advance makes my life easier too, especially since I work on our family farm and time is always so precious. I think it is also important to make food fun, especially if you have a picky eater. Food that is fun and unique looking is intriguing to kids and makes they want to try new things. Here are five healthy and FUN after school snacks you can make for your kids. In a small bowl, mix 4 oz. of Neuchâtel cheese with 4 tablespoons of powdered sugar. Top 4 rice cakes (any flavor you wish) with cream cheese mixture. Top with assorted fruits like raspberries, blueberries, strawberries and pineapple. 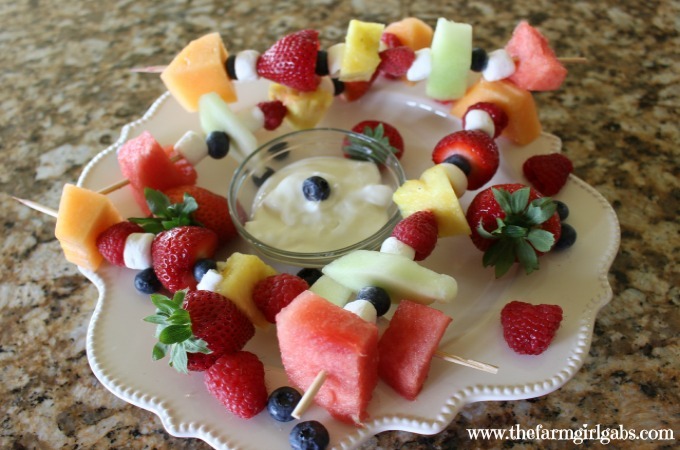 You can use any time of fruit that your kids like or is in season. Pre-heat oven to 400 degrees. Slice or break apart 3 mini bagels and place on a baking sheet. Top each slice with pizza sauce, cheese and any additional topping your kids like. Bake for 15 minutes. Serving size: 1 mini-bagel (2 slices per person). Cut up cubes of watermelon, cantaloupe, honeydew and pineapple. Using a wood skewer, alternate adding the fruit and marshmallows until skewer is full. You can use any kind of fruit your kids like or is in season. Serve with a side of non-fat vanilla yogurt. Spread 3 tablespoons of chive cream cheese on a tortilla (if you don’t like chives, you can any flavored cream cheese you like). Layer with thinly sliced ham. Roll tightly and cut into 1/8” pinwheels. These are also great with thinly sliced cucumbers and tomatoes added in as well. Core and slice apples into 10 pieces. Spread peanut butter on one slice and top with 4 to 5 mini-marshmallows to make the teeth. Spread peanut butter on the other slice of apple and assemble so they look like mouths. Five Healthy & FUN After School Snacks for Kids are a simple solution for snacking boredom. As you can see, healthy snacks don’t always have to be plain and boring. What are some snacks you like to serve your kids? It’s fun to get creative with food. Jazz it up, play with your food, add some funky shapes to make it FUN for your kids to eat and enjoy! Take it one step further and have your kids help you make their snacks. I think it is so much fun to have kids helping in the kitchen. Here’s to the start of a great school year! Enjoy. Healthy Eating Options with Organics Live – Franchise Opportunities Available! 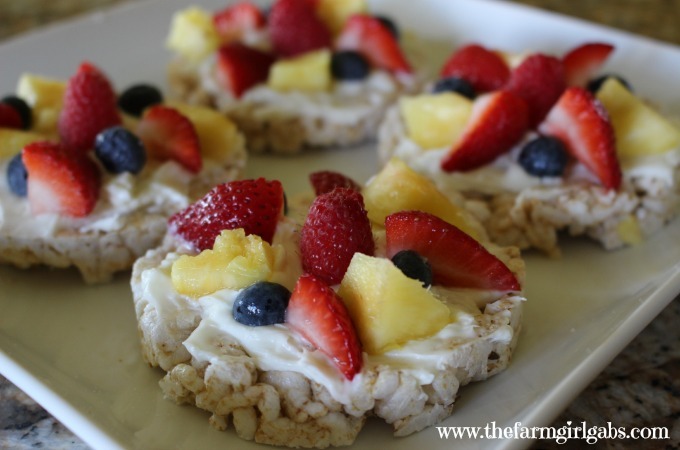 Your mini fruit pizzas are so cute! I’m grabbing the ingredients for them when I go shopping tonight. I never thought of fruit pizza, neat! Love the apples too. The peanut butter apples are so cute! They would also be great for a Halloween party. 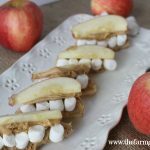 These look like great after school snacks…my kids like apples with peanut butter, cheese and crackers, and hummus with veggies usually. I’m sure they’d like some of these too! Looks so yummy! Thanks for linking at Pintastic Pinteresting Party.